After a particularly rancourous time at work it was felt a few days off might bring more appreciation of what I did and allow for a little exploration at the southern end of the Midland Main Line. A number of locations were scouted and this one, near Harpenden proved particularly photogenic. On April 10th 1981 25269 heads north on the slow lines with a train load of new lorries. The twenty year career of D7619/25269 commenced with almost two years on the Scottish Region, followed by almost eighteen years allocated to London Midland Region depots. Tablet catcher recess fitted (later removed). Time between last Classified repair and withdrawal: 88 months. Time between withdrawal & scrapping: 11 months. July 1968 to Preston Division (D10) on loan, made permanent August 1968. September 1985 to Carlisle Kingmoor. April 3rd 1986 - withdrawn. 25269 was the 280th Class 25 withdrawn, the only Class 25 retired during April 1986. After withdrawal 25269 was stored at Crewe until January 12th 1987 when it was moved to Vic Berry, Leicester. By the third week of March 1987 25269 had been scrapped. Noted Derby Works March & April 1974, included dual braking. Noted Derby Works September - November 1978. 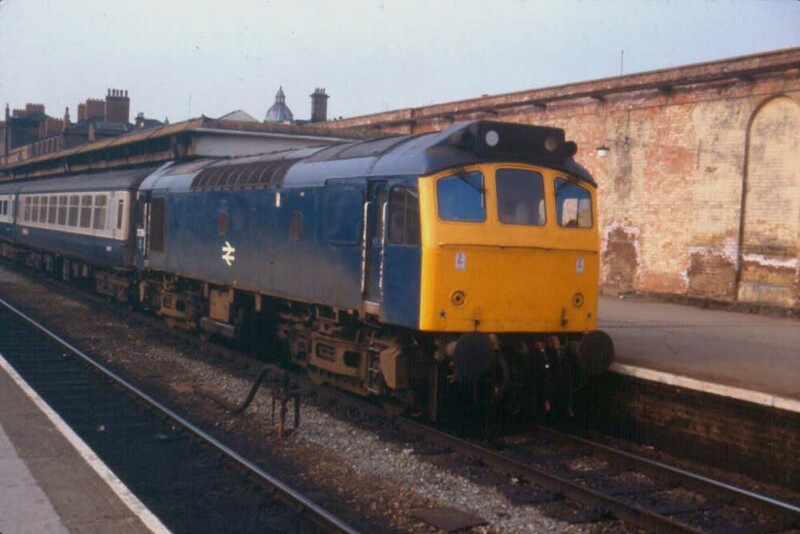 Although the Scottish Region had received a batch of brand new Class 24s for use on duties from Inverness depot, the Region had not, so far received any new Class 25s. However between April & September thirteen Class 25s were delivered from Derby Works to Eastfield (65A) including D7619. These were the only Class 25s delivered with a cabside recess to accommodate tablet catcher equipment. Although based at Eastfield these Type 2s spent much of their time in South West Scotland alongside the BRCW Type 2s quickly sending many Ayr & Hurlford’s Crabs, Black Fives & BR Standards to the storage lines and additionally helped Dumfries lose its steam allocation effective April 30th. At the end of May Ayr placed seven steam locomotives into storage because of the Type 2s arrival. Additionally at this time, with the arrival of these Type 2s, the return of some re-engined NBL Type 2s to service and the tranfer of more Claytons to Haymarket, the Scottish Region were able to put the first of the Class 26s through Works for the fitting of slow speed control equipment & dual braking for use on merry-go-round workings. On October 23rd amid many stored steam locomotives at Corkerhill D7619 was the shed pilot, since no steam locomotives were available. After almost two years allocated to Eastfield D7619 was transferred to the Preston Division (D10) during July. Condition April: two-tone green livery with small yellow warning panels, tablet catcher recesses, no blanking plates, hand/footholds present, straight sided sandboxes, three rung bogie mounted footsteps, exhaust in original location, 'D' prefix present. Passengers on the 9.45 Birmingham - Walsall electric multiple unit service on June 5th 1970 acquired some unusual haulage following its failure at Bescot. The local Walsall shunter, 3781, took the service forward to its destination with the return working, the 10.12 from Walsall hauled by 7619 taking the dead unit back to Birmingham New Street. On September 28th the summer dated Walsall - Yarmouth was worked to Norwich by 7619 & 5235. On June 7th the 07.00 Nottingham - St. Pancras was worked by 7619 & 7514. The 09.03 Birmingham New Street - Weymouth was worked to Reading by 7619 & 7522 on July 22nd. On Semptember 11th the 16.50 St. Pancras - Derby was noted arriving at Derby behind As 7619 & 5246 and a failed Class 45 No.97. On June 16th the late running 08.12 Derby - Yarmouth was worked by 7619 & 7620. On June 30th the 08.00 Walsall - Yarmouth was worked to Norwich by 7619 & 7614. The next day (July 1st) the same pair worked a roundtrip Leicester - Skegness diagram. On February 14th 7619 was noted in the arrivals sidings at Derby Locomotive Works with considerable collision damage to the No.1 cab, the repairs were estimated at £15,500. The driver's side and front appeared to have received the brunt of the damage, the buffers were missing and all the cab window glass was missing. The headcode was showing 9T78. Whilst under repair Dual braking equipment was fitted and possibly the tablet catcher recesses were sheeted over at this time. A longer distance working regularly hauled by Class 25s and featuring considerable mileage ‘under the wires’ was the roundtrip Gunnie – Penyffordd (Wrexham North???) freight, 25269 worked the southbound trip on May 24th. The 17.00 Derby - Matlock and the return 17.50 Matlock - Derby were worked by 25269 on June 3rd. Four days later on June 7th 25269 worked the 13.00 Llandudno Town - Nottingham. On July 5th 25269 & 25187 worked the 08.52 Leicester - Skegness and the return 12.30 Skegness - Leicester. On July 12th 25269 & 25075 had been to Yarmouth on a relief from Derby, however 25075 later noted failed on Norwich depot! One of the more unusual workings occurred on July 16th when 25269 & 25267 worked the 14.25 Birmingham New Street - Paddington and the 17.40 return, not the normal way the diagram worked but necessary due to the lack of crews at Paddington familiar with the Class 25s. A Banbury - Rhyl excursion on April 19th was worked by 25269 & 25303 to Coventry where 82005 took over. 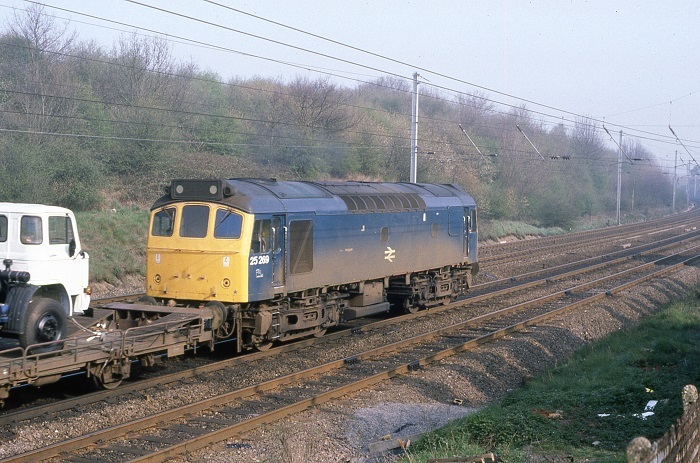 An east – west cross country working which occasionally featured Class 25s was the evening Norwich – Liverpool Lime Street parcels, 25266 & 25269 were noted on May 5th. On September 12th a Brighton - Aberystwyth day excursion was worked roundtrip Wolverhampton - Aberystwyth by 25269 & 25152. 25269 was used to haul 24025/29/33/34 as the 06.45 Crewe - Swindon Works on January 10/11th. On June 4th 25269 & 25218 worked the Derby - Norwich - Yarmouth - Norwich - Derby diagram. On July 2nd 25269 worked the 07.35 Nottingham - Llandudno Town and the return 13.05 Llandudno Town - Nottingham. The longest recorded passenger working for 25269 took place on July 24th with 25117, taking over a Leeds - Barmouth excursion at Crewe, the round trip running just over 300 passenger miles. On July 27th 25269 & 25212 worked the 09.20 Derby - Skegness and the 19.20 Skegness - Derby. The next day (28th) the same pair worked the 08.24 Leicester - Skegness and the return 18.30 Skegness - Leicester. Another lengthy run took place on July 30th with 25269 & 25187 working the 09.47 Nottingham - Paignton. On September 3rd the 09.19 Manchester Piccadilly - Yarmouth was worked to Lincoln Central by 25269 & 25194, returning from there with the 09.15 Yarmouth - Manchester Piccadilly. On February 25th a returning Plymouth - Tring day excursion was worked forward from Kensington Olympia by 25269 & 25324. On July 22nd 25269 & 25220 worked the 07.50 Cardiff - Crewe, whilst on July 24th 25269 worked the 10.00 Crewe - Cardiff. The end of August saw 25269 & 25311 busy with roundtrip Skegness workings, from Nottingham with a relief on August 28th, from Derby on August 30th and from Leicester on August 31st. 25269 was noted at Didcot on January 22nd. The NE/SW route was no stranger to the Class 25s on passenger duties. Here 25269 waits time at Derby on June 12th 1979 with a service originating from Birmingham. During June the 06.32 & 08.03 Peterborough – Kings Cross and 17.18 return continued to receive Class 25 haulage with the 06.32 noted behind 25039 (19th), 25269 (20th), 25319 (21st) also working the 17.18, 25107 (July 10th), 25125 (July 11th) & 26267 (August 1st). On August 18th 25269 worked the 07.30 Nottingham - Llandudno Town and the 13.00 Llandudno Town - Nottingham. On September 1st the Nottingham - Norwich - Yarmouth - Norwich - Walsall diagram was worked by 25269 & 25308, the Derby - Nottingham leg had been worked by 20188 & 20199. On September 22nd the 06.03 Crewe - Cardiff was worked by 25269. 25269 & 25279 were noted on the Kennet - Mountsorrell empties on April 16th, presumably having worked the eastbound loaded train earlier in the day. 25269 & 25286 worked the relief 08.37 Nottingham - Skegness and the return relief 19.10 Skegness - Nottingham on May 26th. The 08.35 Derby - Yarmouth was worked to Norwich by 25269 & 25263 on June 14th, the return leg was handled by 47351. On July 5th the 10.10 Euston - Aberystwyth from Birmingham New Street and the 16.10 Aberystwyth - Shrewsbury were worked by 25269 & 25260. On July 13th a roundtrip (?) Berkhampstead - Scarborough day excursion was worked by 25269 & 25254. On May 14th 25269 worked the 15.18 Norwich - Birmingham New Street and may possibly have worked an incoming servivce from Birmingham as well. On March 13th 25269 was stabled at Blackburn. On March 28th the 13.00 Wolverhampton - Euston was worked to Birmingham New Street by 25269 due to the power being off for engineering work. 25269 was stabled at Workington station on June 18th. The 07.38 Shrewsbury - Aberystwyth and the 10.07 Aberystwyth - Euston to Wolverhampton were worked by 25269 & 25277 on August 14th. On August 20th 25269 was on banking duty between Saltley & Bordesley Junction. On August 21st the 07.40 Euston - Aberystwyth from Wolverhampton and the 14.00 Aberystwyth - Shrewsbury were worked by 25269 & 25262. A week later on August 29th the 11.20 Liverpool - Paddington was worked from Birmingham New Street to Paddington by 25269, returning north with the 15.50 Paddington - Manchester Piccadilly as far as Birmingham New Street. 25269 was noted northbound at Dent Head with a mixed freight on September 16th. Three days later on September 19th 25269 worked the 02.57 Crewe - Rhyl. On January 5th a Liverpool - Glasgow Central was worked to Preston by 25269 & 25060. On the evening of March 22nd (or 24th) 25249 & 25269 were noted northbound with a train of LPG tanks at Bristol Temple Meads. 25269 was stabled at Warrington Arpley on April 23rd, the previous night 25269 had been the 'Bank Engine', used at night time only for freights that had left Arpley Sidings and needed a shove going up the bank towards Acton Grange. On April 24th 25269 was noted near Orrell Park during engineering work. On June 25th a Gillingham - Welshpool charter was worked roundtrip Wolverhampton - Welshpool by 25269 & 25249. On August 14th 25259 & 25178 assisted two services between Rugby & Bletchley due to the power being off for engineering work. The 19.30 Crewe - Cardiff failed before departure behind 33045, 25269 took the service forward. The 'Cumbrian Mountain Pullman' railtour was worked by 25269 & 25190 between Carnforth & Preston on December 10th due to the power being off for sigalling repairs. On December 15th the 18.20 Glasgow Central - Manchester Victoria was worked forward from Preston by 25269. On December 30th the 15.25 Barrow - Crewe with 85005 hit an object near Weaver Junction, 25269 assisted the train to Crewe, then returned north later in the day with the 19.10 Crewe - Preston. 25269 was stabled at Bletchley on April 26th. 25269 was stabled at Cockshute on June 2nd. The result of 33001 catching fire on August 7th on the 17.20 Cardiff – Manchester near Moreton on Lugg led to 25254 & 25269 on the following Severn Tunnel Junction - Mossend freight being split up. 25269 replaced 33001 on the Manchester service whilst 25254 took the Class 33 back to Hereford. 25269 was stabled at Saltley on September 5th. Three days later on September 8th the 07.35 Euston - Aberystwyth from Wolverhampton and the 14.00 Aberystwyth - Euston to Wolverhampton were worked by 25269 & 25288. On September 15th the 10.10 Euston - Shrewsbury from Wolverhampton was worked by 25269 & 25249. 25269 was stabled at Carnforth on October 6th. 25269 was noted southbound at Leyland with a train of ballast on October 10th. 25269 & 25283 were noted at Chester General with a Ravenscraig - Shotton Coil Train on October 12th. On November 19th the Ellesmere Port – Severn Tunnel Junction ran behind 40150 & 25269. A stranger to the Strathclyde area on January 4th was 25269 hauling molasses from Greenock, the locomotive being later noted at Motherwell shed. The 18.05 Euston - Blackpool North was worked forward from Preston by 25269 on January 21st. The next day (22nd) 25269 worked the 06.18 Blackpool North - Euston to Preston. 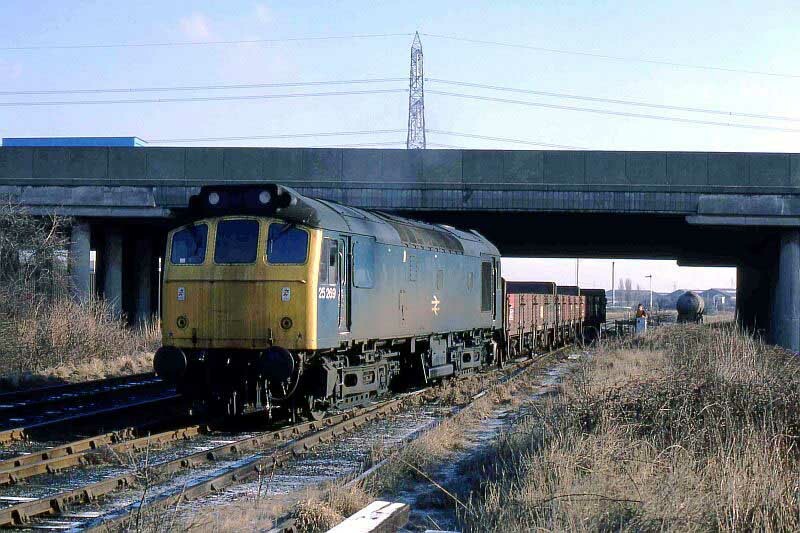 On a damp, overcast February 25th 25268 & 25269 worked a loaded sand train from Oakamoor Sand Sidings to St Helens(?). On the evening of May 30th 25269 was noted with parcels vans at Birmingham New Street. 25269 was stabled at Warrington Arpley on August 5th. 25269 & 25262 were noted on a Ravenscraig – Llanwern steel coils at Hereford on the rainy night of December 6th. Photograph courtesy Ron Kosys 25269 at the south end of Hawkesbury Lane yard on a frosty February 27th 1986 working the 6T46 job. 25269 is seen here shunting some engineers wagons in the shadow of the bridge that takes the M6 motorway over the yard and the mainlines. Time was short for 25269, it has about a month left in service, being withdrawn on April 2nd 1986. 25269 was withdrawn on April 3rd 1986. Page added September 19th 2012.